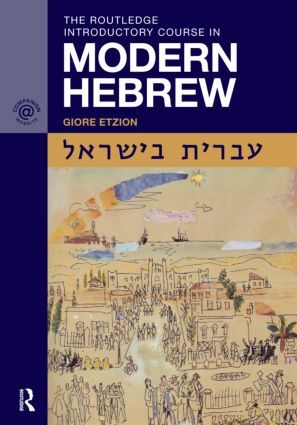 The Routledge Introductory Course in Modern Hebrew: Hebrew in Israel is an integrated language course designed specifically for classroom–based learners. The course contains 90 lessons combining texts, grammar explanations, and exercises. This is supported by a Companion Website with audiovisual materials to guide the student through the key skills of reading, writing, speaking, and listening. audiovisual reference charts of numbers, colors, the days of the week, etc. Hebrew in Israel provides everything that students and instructors need for an engaging and effective learning environment. To the user. Organisation of the lessons. Course Website. Culture. Reading and Writing in Hebrew. Overview. The Alphabet. The Vowels. The Syllable. The Cursive Alphabet. Unit 1. Unit 2. Unit 3. Unit 4. Unit 5. Unit 6. Unit 7. Unit 8. Hebrew–English Dictionary.